From Clark Smith’s Postmodern Winemaking laboratory, this wine is a focused study in what is meant by “minerality” in red wine. “Minerality” is a source of great controversy. It was seldom used to describe wine 20 years ago. Then it entered the lexicon as a way of capturing the “wet stone” or “burnt matchstick” aromas in Riesling or Chablis. Today, “minerality” also refers to red wines with a crushed rock or gravel aroma and an angular, chalky texture which doesn’t come only from the tannins but seems to be carried by hi-toned acidity and sometimes followed by a citris-like snap or electric spark on the finish. We sometimes describe fruity wines which are fermented to dryness, with little residual sugar, as “sweet”. This is a cross-modal metaphor since sweetness is a taste, not an aroma. The flip side of that is wines that exhibit this non-fruit character which we could describe as having “olfactory dryness” although this phrase hasn’t caught on. Think of minerality as a dry earth character—not wet like mushrooms, barnyard, or freshly turned soil, but earth stripped of organic material. This Merlot-dominated Meritage with a healthy dose of Cabernet Franc (13%) prominently displays this minerality especially on the palate. It shows deep, black cherry aromas with sage and provencal herbal notes associated with the south of France, yet dry as if desiccated by weeks of desert winds. A subtle background caramel note reminds you this is California fruit. On the palate, that juicy California fruit provides a soft, rich underbelly that moves and stirs in its prison, then sits quiet as stone quickly succumbing to a taut, ascending line of acidity, which plies the upper register where twangy guitars hang out with sultry sopranos. Sandy, persistent tannins provide context adding to the feeling of a hot night on a lonely desert highway. 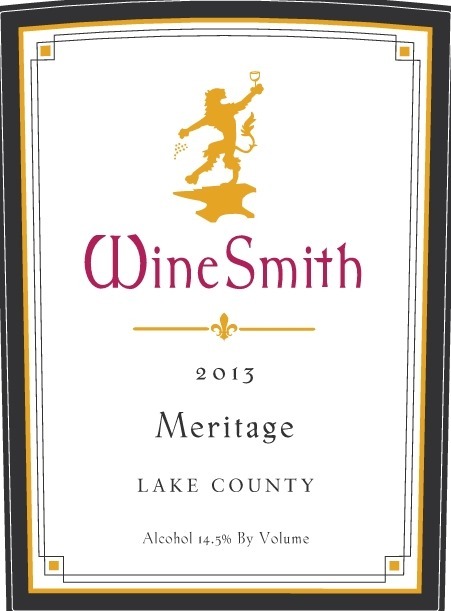 Most California Meritage plays in the lower register, basso profundo. This one is all atmospheric twang, the in-betweenness of California and France, which is after all what postmodernism is all about. Pair with Deep Red Bells by Neko Case, who does dry desert sounds as well as anyone. Technical Notes: Fruit sourced from Diamond Ridge Vineyards in Clear Lake, pre-malolactic micro-oxidation, aged 51 months in neutral French oak. Review based on a industry sample.